This book demonstrates the complete building of an ancient book store, including the full interior with furnishing, decoration, merchandise and accessories. This book is ideal for who wants to start building and furnishing himself: there are clear step by step work instructions, that are illustrated with many photos, for the building, decorating, furnishing and how to make the accessories. Although the book is in Dutch language, many people from foreign countries have bought it and are enthusiastic about the clearly illustrated work instructions! If you have read the book, you can make your own book store, or your own project, with use of the demonstrated techniques. Moreover, thers is lot of scene photography, both of the book store, as well as earlier projects of Jacomine. These photos are certainly a source of inspiration for your own work. 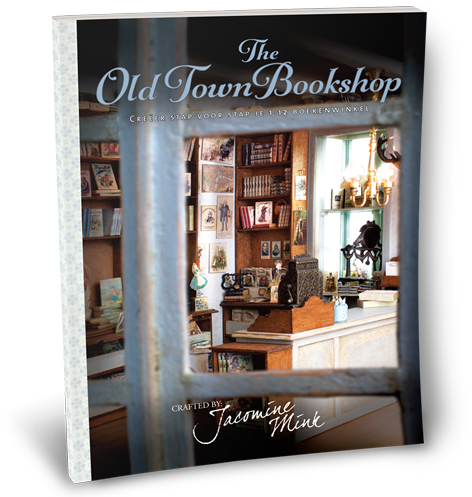 The Old Town Bookshop is written in Dutch language, but the extensive photography of all work instructions will help you. It is already bought and read by readers from more than 10 different countries. The book has a nice, large size (28 x 21.5 cm), is in full color and has 112 pages. The price is €19.95 (excl. postage costs) and you can order it here.